Luminosity, joy and serenity. 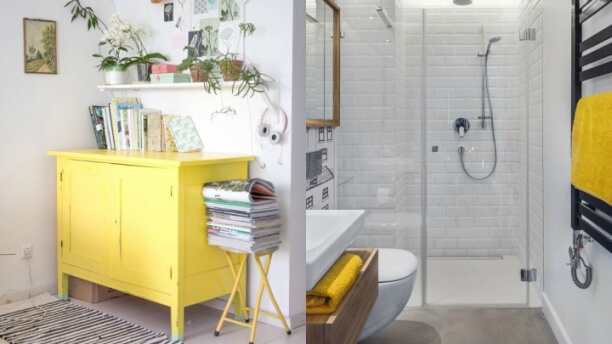 These are three qualities that you will be able to contribute to your home if you decide to decorate it by combining white with yellow. These are tones that work very well together, since the vividness of yellow can be calmed by white, or if you think that white does not add much you can give it an extra vitality with yellow. In any case, it is a good combination. Today we are going to see some ideas to use them together in any of the rooms of your house. The first idea is to bet on yellow as the main character and add small white touches to reduce some intensity. This idea may look great, for example, in a youth bedroom, where yellow is a color that encourages creativity and happiness. The yellow furniture on white walls will be very cool. Now I show you the opposite idea, that is: decorate with white as a base and introduce details in yellow. If doing it in greater quantities is excessive but you love this color becomes an excellent solution to combine both shades. Look at these examples. As you can see, these are small brushstrokes that add a very cheerful air to the room. It can be enough with a piece of furniture or with some towels in the bathroom. You can also accommodate a third tone. In this case, yes, by way of small detail. If you want to introduce another color you can play with the complementary color wheel, and add one stronger than contrast with both. A purple or strong blue, for example, would be a good choice. Before I mentioned the idea of putting yellow furniture on white walls but, what do you think of painting the walls of yellow color? My recommendation is to paint only one of the entire stay, and not all, as I think it could become saturated and would not be too relaxing. Although if you opt for a very soft pastel yellow you could paint them all. You can also play by creating a half-height frieze and leaving the bottom of yellow color and the top in white, for example. 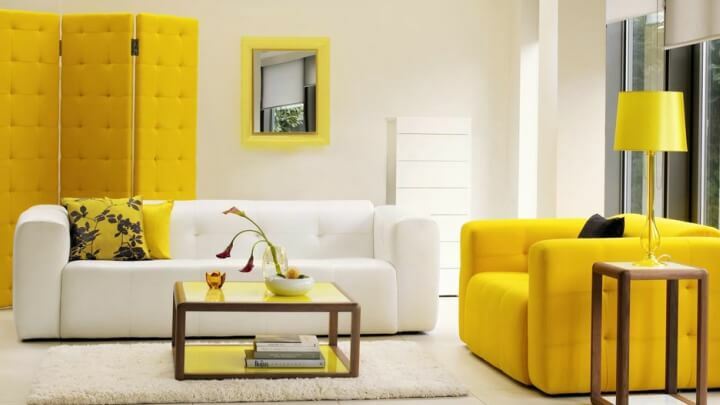 A combination that can be very cool is to play with furniture in white and yellow. In this room, for example, two sofas of these two colors have been used and other details have been added in yellow. The tonality of the latter can be more or less alive, depending on what the final result you want to achieve in your decoration: to be more serene, to be more intense… In any case, it will be a cheerful decoration. Textiles are fundamental when entering color details at home. If you have opted for a white base the yellow textiles will be great. Imagine your living room, with the white walls and even the furniture. Now, you place yellow cushions on the sofa, a carpet on the floor and yellow curtains on the windows. You will be facing a very refreshing and cheerful interior design. The same can be done in the bedroom with the bedding.